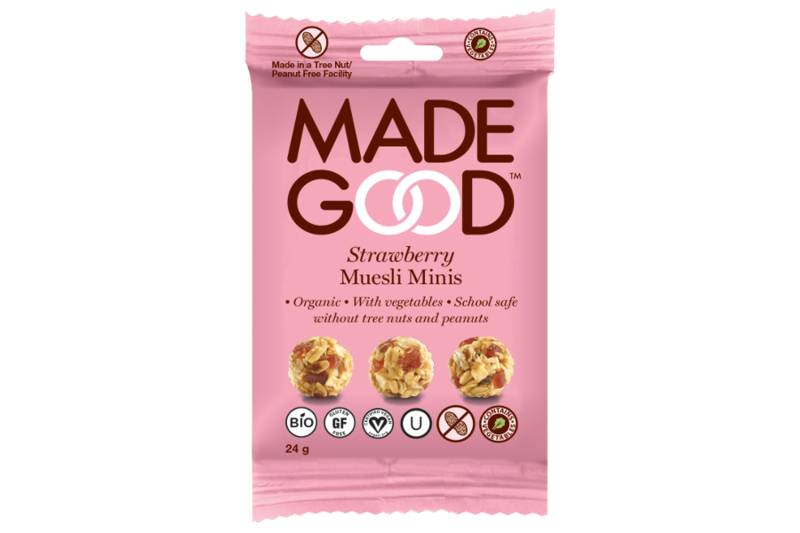 Granola Minis with Strawberry contains sweet juicy strawberries and pure rolled oats. These Granola Minis taste like strawberry season all year. Feel good about choosing Strawberry. Strawberries are full of antioxidants and we use pure rolled oats which are believed to lower LDL, “bad cholesterol”. These mueslis are slow to digest, keeping you fuller longer. All ingredients are ethically sourced and the product are free from 8 allergens. Pure rolled oats* (37%), apricots*, strawberry pieces* (apple juice concentrate*, apple puree*, strawberry puree*, cherry juice concentrate*, apple pectin, natural flavour*) (8,5%), cane sugar*, agave nectar*, apples*, sunflower oil*, whole grain crisp brown rice*, coconut oil*, agave inulin*, tapioca flour*, vegetable powder (spinach, broccoli, carrots, tomatoes, beets) (0.4%), shiitake mushroom powder, strawberry flavour.